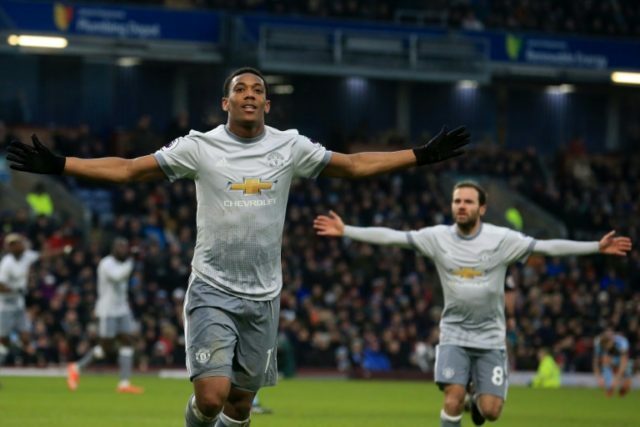 Burnley (United Kingdom) (AFP) – Anthony Martial proved the match-winner for Manchester United as Jose Mourinho took time off from his high-profile pursuit of Alexis Sanchez to mastermind a 1-0 victory at Burnley in the Premier League on Saturday. The Frenchman scored in his third consecutive Premier League game for United — the first time he has accomplished that feat — on a day when the pending arrival of Sanchez from Arsenal was still very much the centre of conversation. The Chilean forward is expected to complete that move, with Henrikh Mkhitaryan moving in the opposite direction, this week and he will join a United team still entertaining hopes of catching Manchester City at the top of the league table after this victory. United took the lead after 54 minutes with a goal that owed everything to Romelu Lukaku’s strength and persistence as he won an apparently lost cause in midfield. Lukaku shrugged aside Phil Bardsley in a challenge and won the chase to the loose ball before delivering a magnificent 30-yard pass for Martial, unmarked in the area, who finished clinically with an unstoppable, 15-yard right-foot strike. It was the start of a far more entertaining second half than the first had been and the hosts might actually have equalised within two minutes, following a foul on the edge of the United area by Juan Mata on Ashley Barnes. Johann Berg Gudmundsson delivered a skilful free-kick which clipped the United crossbar on its way over. Gudmundsson was also in the thick of the action moments later when he met Charlie Taylor’s cross with a header which struck defender Chris Smalling and led to unsuccessful appeals for a penalty. Mourinho’s sense of urgency was justified with a dangerous set-piece header from Ben Mee being tipped over by David De Gea. Defour also set up an opening for Barnes which the forward headed wide while United’s wastefulness continued when Lingard dithered and saw an effort blocked by Mee after a swift counter and Martial was denied in the closing minutes by home goalkeeper Nick Pope. In a first half lacking any real clear-cut chances, the first, and best, had fallen to Burnley with just five minutes gone but James Tarkowski headed down and wide from a free-kick. It took until the 41st minute for United to seriously threaten when Ashley Young, recalled in place of Luke Shaw, beat Bardsley and advanced into the home area before curling a shot just beyond the far post. Young’s chip into the area found Pogba who lobbed the ball, first-time, over the goal and Pogba sent Martial away for a shot which was well blocked from a promising position. On the stroke of half-time, Pogba again set up an opening for Martial with the winger this time placing a shot wide of Pope’s left-hand post from just inside the area.